Nothing says "I Love You" like a beautiful bouquet of flowers. On Valentine's Day most Women expect flowers and most Men comply. However, a lot of Men that I know buy the same cheap red roses every single time. It is true, Women love roses. We also love variety and surprises. This Valentine's Day, knock your Woman's socks (and possibly some other clothing) off by buying her a beautiful assorted arrangement. Want to take it a step farther? Have 1-800-Flowers.com deliver them to her work where she will get to show them off to all of her jealous co-workers. Trust me, she (and her friends) will be raving about this long after Valentine's Day has passed. If you are completely convinced that your Woman will only accept roses, 1-800-Flowers.com can help with that too. They can even provide some chocolate, stuffed animals and a beautiful vase to go along with it. I actually posted the last 2 pictures twice (in the collage and by themselves) because I wanted you to be able to see them clearly. See how big and beautiful the roses are? That white rose is now double the size it was in this picture because it opened up even more! You can right click on the pictures and open them in a new tab to see them even larger. If you are like me, when you see an arrangement like this that says they can change the flowers to what is available, you worry. Are they going to give you all the cheapest flowers? Are they going to make it look completely different? As I already said, mine looked very similar to the picture. They definitely did not fill it with cheap flowers! I have 5 lilies (4 of which are opened very large), at least 5 roses (all of which are opened and are the biggest roses I have ever seen! ), 5 large pink gerberas, several smaller purple gerberas, 2 clusters of alstroemeria, with lots of calcynia and salal in between. To be honest, my counts may be a little off because there are so many flowers that some get hidden under others. You definitely get your money's worth with this arrangement! I have had my flowers for 4 days now and I am still deciding which flower is my favorite. I have always adored lilies (and I have never had any before now). The lilies are huge and they open more each day. I love how they look like they are trying to reach out and grab you. They are a beautiful pink with white outsides with long green styles and purple stigmas a the end. I also adore the roses. Like most Women, I love roses. I really LOVE them combined with other flowers and this arrangement is perfect. Sorry to be repetitive, but they are huge! Definitely the largest roses I have ever seen. I also love that there are red and white roses in the Fields of Europe Romance. My other potential favorite flower its one that is often overlooked. The beautiful purple alstroemeria. These flowers are commonly known as "Peruvian Lilies". They are nothing like normal lilies. They are petite and have two tepals on each flower that are marked with lines that give them an exotic look. 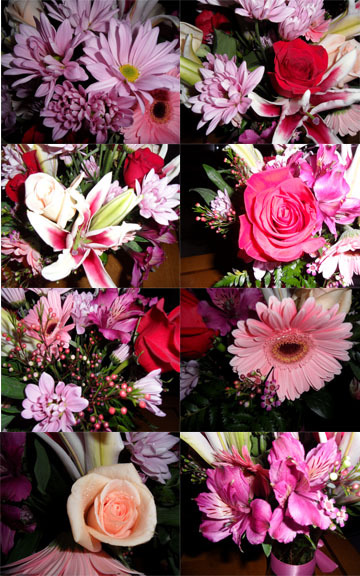 If you don't know what these flowers look like, they are in the bottom right hand corner of the above collage. There isn't a single part of this arrangement that I don't love. Even the salal add to the overall look. The Fields of Europe Romance also smells incredible. My Husband is making fun of me because I keep sniffing the flowers and saying "but, they smell so good!". We actually are keeping them in our bedroom at night and when we are gone to keep our Cats from knocking them over and our bedroom smells like flowers. The whole arrangement smells great, but it seems to come mostly from the roses and lilies. The smell is so relaxing and comforting. I think every Woman should get to experience the Fields of Europe Romance at least once in their lives. The only thing that I didn't like about this experience was that the local florist that delivered the flowers left them in the hallway of my apartment building on the floor. We have had a lot of things stolen from the hallway. It would also be easy to open the door and knock them over without knowing that they were there. Luckily, they were unharmed and I didn't knock them over. Of course, I didn't know when my flowers would arrive. 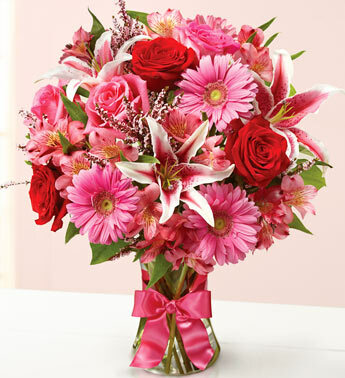 When you order from 1-800-Flowers.com you will be able to pick your delivery date. You can also avoid this by having them delivered to your loved one's work if you know she won't be home. NOTE: Try everything in your power to have HER/ HIM to be the one to receive the flowers. It definitely sweetens the experience and makes them feel special. Yes, all of those are less than $40 each! Now, for the great news. 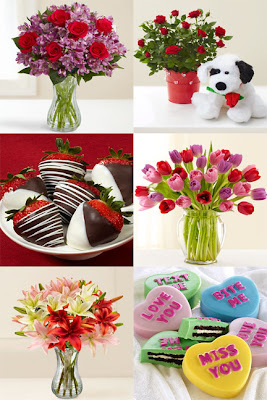 One lucky reader will win a $50 gift card to 1-800-Flowers.com! That means you could get one of the above or choose from lots of other goodies on the site. Unfortunately, I did not receive my flowers in time to get this posted and to the winner to where they could order for Valentine's Day. However, flowers are absolutely great "just because I Love You" gifts. I actually like getting flowers on non-holidays/ birthdays because it means that he thought of you and wanted to do something special. He didn't just buy them because it was required (Gosh, I hope some Men read this review!). Visit 1-800-Flowers.com and tell me something you would love to have for yourself or give to a loved one. I would love to enjoy the Red Rose and Calla Lily Bouquet, just because their beautiful! I like the Fun & Flirty Bouquet. I like 1800 Flowers on Facebook with my username Mary Happymommy. I'd love to get the Love and Passion orchids for my mom! I would love to have the Premium Ruby Red Roses. I'd get the Hearts Afire Chocolates Tower for myself. I'd love to get the Candy Bar Brownie Cupcakes for my hubby. I would love to give the Fancy Hand Dipped Berries as a gift! I would like to have the Fields of Europe flower arrangement. I would love to have the Hearts Afire Chocolates Tower! I like the Exotic Breeze™ Orchids. I'd send a friend the Fruit and Cheese Hamper. The Godiva Bakery Dessert Truffles! I'd send the Gardenia in a Basket to my "grandmother" since it's one of her favorite flowers. We must have the same tastes because my favorite arrangement is also the Fields of Europe Romance bouquet. I chose many of those flowers for my wedding bouquet almost 15 years ago! Like you on Facebook as Selective Sensualist. Follow 1-800-Flowers.com on Twitter as SSensualist. Follow you on Twitter as SSensualist. #1: Entered your Gourmet Gift Basket giveaway. #2: Entered your Gourmet Gift Basket giveaway. #3: Entered your Gourmet Gift Basket giveaway. I'd love to receive the 2 dozen Red Roses from my hubbie. You listening? I entered the Circle Pendant Necklace giveaway. I love the Sentimental Surprise. i love the Passionate Tulip Bouquet.